When Life Gives You a Flat Tire. RMB believes in building true relationships. See our next featured Client. To All RMB MyWallet Cardholders, upgrade to the EMV Card Now! Dear RMB MyWallet Cardholders, kindly upgrade to the EMV Card Now for your added security. Starting October 16, 2017, you can no longer use your old magstripe cards. For more details on how to get your FREE Debit / ATM and MyWallet EMV cards, please click below. Click to RCBC link to know more..
Rizal MicroBank – A Thrift Bank of Rizal Commercial Banking Corporation (RCBC) is one of the youngest affiliates under the Yuchengco Group of Companies. Established in 2010 by RCBC, Rizal MicroBank is the result of the merging of Merchants Savings & Loan Association, Inc. (A Thrift Bank) and Pres. Jose P. Laurel Rural Bank-both acquired by the Universal Bank in 2008 and 2009 respectively. 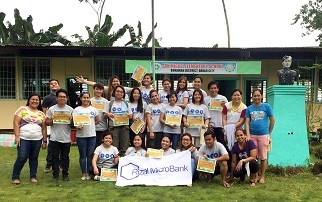 Rizal MicroBank is focused mainly in providing loans to microenterprise and small business operators as well as value chain players in the agricultural sector. Presently, Rizal MicroBank operates in key areas in Luzon, Visayas and Mindanao with a total of 18 branches and 5 micro-banking offices. First Loan: 3 months and weekly payment. Succeeding loans: Negotiable, depending on payment behavior. Regular passbook-evidenced and interest-bearing deposit product with fixed interest rate and can be withdrawn anytime. Regular passbook-evidenced and interest-bearing deposit product that is a component of the bank’s loan products. Certificate of time deposit evidenced issued by the Bank with a fixed maturity date and earning an interest rate. A low-interest bearing deposit product that allows individuals or institutions to access a wide-range of financial services, with ease of payment as a primary objective using bank checks. Living up to the bank’s core value of Malasakit, Rizal MicroBank employee held a BrigadaEskwela activity. 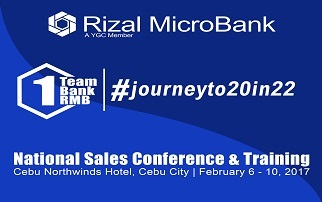 Rizal MicroBank held its first ever National Sales Conference and Training last February 6 to 10, 2017. 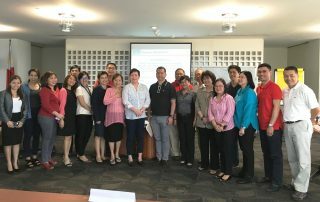 In October 2016, Rizal MicroBank (RMB) held a strategic planning activity.